The Rexel Mercury RDX1850 is designed for an office environment with up to 20 users. It will shred documents into approximately 200 4 x 45mm pieces and it can take up to 19 sheets of 70gsm paper, or 18 sheets of 80gsm at a time. 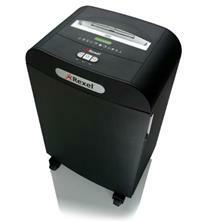 It has a P-3 security rating so it is suitable for the shredding of confidential documents. The RDX1850 features Mercury Jam-Free technology meaning it will only shred stacks of paper within its capacity - this is detected by a sensor in the paper feed area measuring the thickness of the paper about to be entered and a light system telling you if it’s OK to shred or not. Other features include self-cleaning cutters (just replace the oil when prompted, product code 1760049) and an induction motor for quiet running. Up to 400 sheets of shredded paper can fit into the 50 litre capacity waste bin and recyclable bags from Rexel (product code 2102441) can also be used with the shredder. Alternatively polypropylene sacks can be used, product code 40070. The RDX1850 will shred a variety of media including CDs and credit cards (as well as staples and paperclips) and this coupled with its ability to shred confidential documents makes it a good all round choice for business shredding.